Tidewater Village is a settlement founded by the descendants of those who first protected the Sea God’s altar. 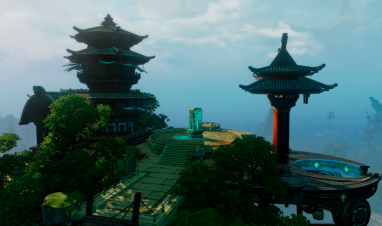 Located above Sulan, it serves as one of the many factions of Nuanor – a place where players can earn exclusive faction rewards and various desirable items, the value of which often depends on the players favor with said faction. Given the denizens of Tidewater Village have passed down the Sea God’s teaching for many generations, it is a place rich with spiritual culture and long-standing beliefs, making it a worthwhile visit to any would-be tourist or budding adventurer. Much like all other factions, there are 5 different cards you can earn depending on your favor with that faction, ranging from Silver (Friendly), Gold (Esteemed), Platinum (Respected), Diamond (Revered), Black (Exalted). By gaining more favor with a faction, rewards (typically vendor based) increase thanks to a higher level of respect and trust built with the faction members. By reaching revered status with Tidewater Village, for example, you will be gifted a blue 'Cross Hairpin' head ornament which cannot be acquired by any other means, whereas reaching Exalted status gives you the opportunity to accept the Tailoring Expert's test. By passing such a test, you may acquire the Master Tailor's Tome which can be used to learn very special recipes. In short, it is always worth spending time with each faction to see how you can benefit them, and, perhaps more importantly, how they can benefit you. No Card: Walnut, Pine Nut and Ascension Essences. Gold Card: Silk Cocoons, Sweetdew, and Silverstones. You can also purchase the Small Bamboo Jar waist accessory, as well as the precious Dragonfly Fragment IV which can be used for crafting black market wings, featured in our previous wings article. Platinum Card: The Small bamboo Shoot head accessory becomes available, as does the Sweetdew chest which will give you 3x honeydew. Diamond Card: The final item, a Bamboo Shoot Back Accessory, is now yours for the taking. As expected, factions won’t throw away their goods for free, nor will they sell their most precious goods to passing strangers. This is where Faction Quests come into play, allowing you to build up you favor and prove your worth. 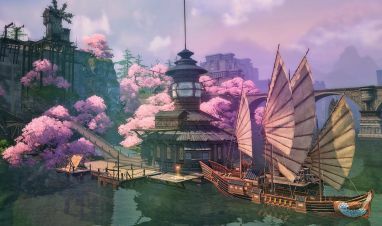 Regarding Tidewater Village specifically, you may find yourself attempting to save Pandas from bandits, defending local Sea God shrines from being defiled by local beasts, or obtaining various goods from other vendors across the land to be brought back to the village. Just how far are you willing to go to earn the Tidewater’s trust? We hope you enjoyed this article and look forward to meeting you in Tidewater Village! Learn everything about the central capital city of Nuanor – Sidus Ur! A treehouse is one thing – a whole culture suspended high in the air by nothing BUT trees is another.